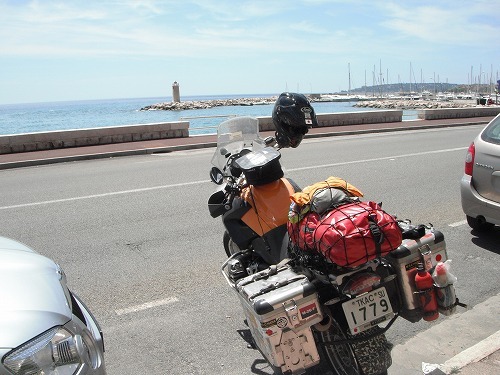 2012.06.06 モナコとカンヌ、おふらんす。 / Passing thruogh Monaco and Cote d'Azul. I am in France! モナコとカンヌ、おふらんす。 / Passing thruogh Monaco and Cote d'Azul. I am in France! I got up at 6:30am and left the hostel just after 7:30am. I was aiming to get to Cannes or Aix-en-Provence today. Why? Because there were constant traffic jams! 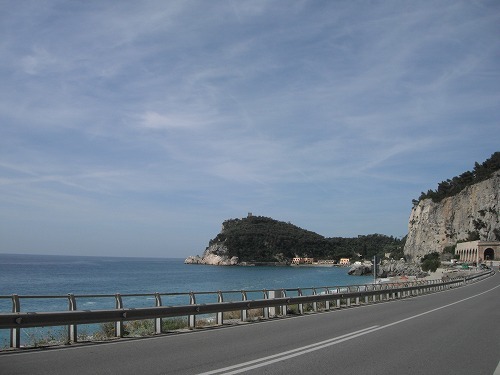 There were many towns along the coast, and there were buses on the way, but there was no exptra space for bus stops, so once the buses stopped, all the traffic stopped. Also there were many roundabout, that made the traffic stucked. I knew it would take long time to ride through without using a motorway, but I did not expect this much of traffics. But at a petrol station, a gentleman gave me a spray can of helmet visor cleaner. Nice. Some Italians are really nice and freindly (not all). 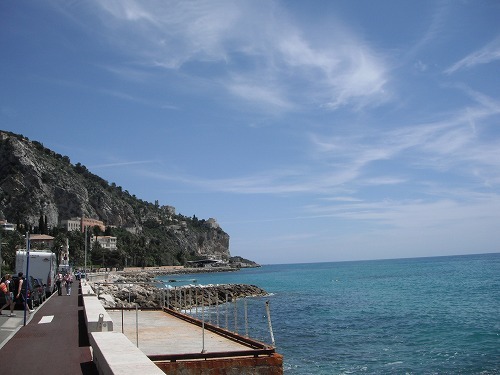 I French side, the sea became more blue and emerald green. It was really beautiful. I found a bakery and bought a sandwitch for lunch. I had it at the see side. Awesome!! 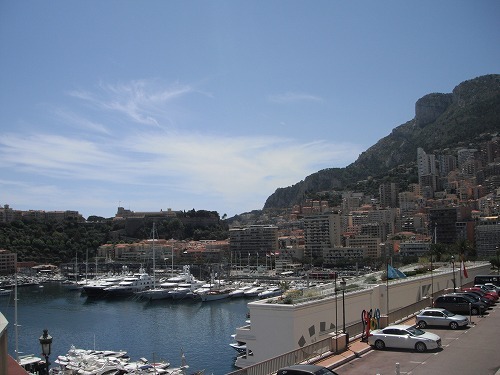 After going around the city many times, finally I found a parking space where I could see a nice look of the harbour. The harbour was beautiful . I realised that it was the slope of F1 race track. 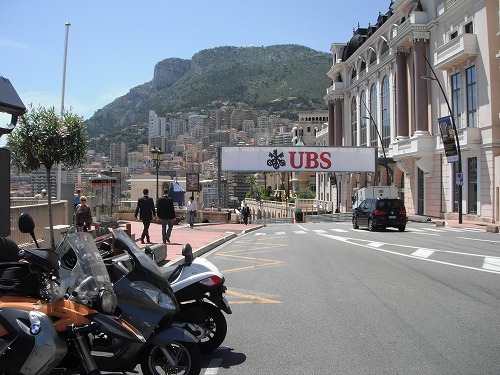 There was a banner of UBS, and down there there were banner of Tag Heuer and Pirreri, so I thought they were preparing for the F1 Monte Carlo Grand-Prix. Actually I wanted to ride through the chicane or othre parts of F1 circuit, but I did not know where and I was getting tired of the traffic, so I moved on. 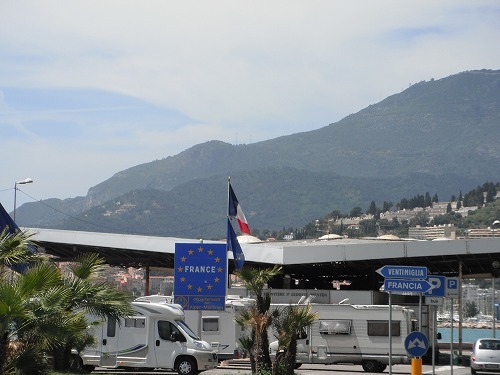 I headed to a campground in Cannes. In French side, there were lots of roundabout, so I could not make much progress. I thought some of roundabouts should be replaced with traffic lights to make smoother traffic flow. I got to Cannes after 4pm. As the sun was still high, I decided to keep going to make tomorrow easier. Finally after 7pm, I arrived Aix-en-Provence. I was so exhausted. I was riding for 11 hours or more!! No wonder I was so tired. After I pitched the tent at a campground, I went to buy some foods for dinner. But the nearest supermarket was already closed, so I walked to nother one. But on the way, I found am Asian take away stand, so I bought stir fried noodle for 3.50 Euros. According to the lady, there are many Japanese residents in the centre of Aix and there are many Sushi restaurants. I did not guess that so many Japanese living there. Tomorrow I will head to Toulouse where I am expecting to catch up with Jean-Yves I met in Ningaloo reef, Western Australia. It's been more than 2 years since I saw him last!